To me that's a very definition of a racing incident. First lap, hard battle with multiple cars, one slight error (very tiny oversteer) in the midst of things. In here the penalty was 100% based on the result of what happened, not the actual happening/mistake itself. Meanwhile Verstappen can block and weave in the straights all he wants, causing damage and ruining races even in the closing stages and gets away with nothing. (mind you he seems to have finally grown up even a little bit for this season, maybe after his 5th season he's finally learning). Finally a good start for Hamilton and that is what won him the race. Him and Bottas looked comfortable didn't look troubled. As others have said, the team order from Ferrari made sense but the strategy for Leclerc after was just bizarre. The first pit stop was in neither here nor there. Verstappen did a good job again in the race. Ricciardo had a very quiet and solid race which will be good for him, I think we'll see him start to get on top of Hulkenberg from now on. Driver of the day is definitely Albon. I really like him both in and out of the car. I am so old, that by 2006 I already got a bit bored by F1. Fair enough. I thought Max stopped pretty early to try and force an undercut but happy to be wrong on that. Yes, Red Bull pitted earlier than Ferrari thought they could by deliberately pitting Max into traffic, (which was fine at this circuit as it's easy to make short work of slower cars on worse tyres so the time loss for traffic is small). I presume that Ferrari felt Red Bull would try to wait an extra couple of laps to be clear of the traffic before trying the undercut, by which point Ferrari would likely have pitted one of their cars as they would have been clear of that traffic slightly before Max would be. Up there with the worst penalties I've seen. Especially given it was a drive through too, so 20 second(ish). Not exactly sure what Kyvat, on cold tyres, at the race start, could have done differently. I'm not even sure you could call his oversteer an error, as opposed to just one of those things. Definition of 1st lap racing incident. Why did the commentators say things so incorrectly today. Leclerc and Kvyat both kept getting demonised by them. Incorrectly. Whoever was in charge of the broadcast today must have been suffering through a serious hangover from last night. So many bad shots were cut to: cameras moving around, odd zooming into cars at the final corner, some shots being held seconds longer than they should have been. Woeful! Yep, bellow current standards. More like 90's. To be fair, even if the cuts had been better, it wouldn't have made the race any more entertaining. You can bet the next race at Baku won't disappoint! Renault (team) & Haas are struggling with either reliability or tyre temperature issues. This is a blessing in disguise for Alfa Romeo, McLaren, Toro Rosso & Racing Point as well. Yes. I've taken breaks from F1 before though. So you have watched 13,14 and 18 in the last 10 years? You missed some great years 10,12,17 and watched possibly two of the worst seasons this millenium in 13 and 14. As Gasly pitted with only two laps to go, Leclerc was already past the pitlane by the time Gasly got there and so couldn't go for a fastest lap attempt. Well, he could have gone for it by pitting with two laps to go like Gasly did, but at that point he was just trying to take the point from Vettel which wouldn't have earned Ferrari any more points at that stage, and instead would have cost their lead driver a point. Gasly set FL on second to last lap, meaning he pitted with three left. Since Leclerc was ahead on track, reacting to Gasly would have meant pitting two laps to go and having the last lap to make an attempt. In hindsight, I'm sure Ferrari would rather have Leclerc take a point from Vettel than for Gasly to. But that doesn't mean in hindsight they would take the risk of pitting. I really don't understand the aversion to pitting for a fastest lap attempt. We see plenty of times that teams are willing to pit late in the race because their tires are losing pace, many times when they're not at risk of being overtaken. Prime example is Verstappen pitting late today. He had a sizeable gap to Leclerc on tires that, while several laps newer, probably didn't have enough life left to close the gap, let alone make a pass. Regardless, RBR was willing to risk a pit stop error and put Verstappen behind Leclerc because they felt the pace in new tires was worth it. What if Leclerc didn't take another stop? In that case, Verstappen regaining his position in front of Leclerc is really iffy. From my perspective, it was a bigger gamble for less gain than for a team to pit for FL when they have a big enough gap to maintain position. Ah, my bad. In that case they should have pitted Leclerc to cover the Gasly fastest lap attempt then. This actually means that Red Bull pitted Gasly a lap too early then, giving Ferrari a chance to react with Leclerc. They were lucky that Ferrari didn't punish them for this mistake. Leclerc talked about having gear issues after his final stop. I wonder if that was why he wasn't as quick as you would think after the second stop. He was much quicker than Verstappen after stop one so could have been that. That's true; I was forgetting about the gear issue. The radio communication that was broadcast implied it was fine, but we don't know if it was fine because of settings that were changed, or whatever else. 14 wasn't that bad. I'd say 15 was much worse, personally. They're sacrificing the team to protect Vettel's ego, is what it feels like to me. Gasly did only just nick the fastest lap from Vettel by 0.094 on brand new softs. Actually that shows pretty much what we thought from the broadcast, Vettel was about 1 to 2 tenths quicker at that stage as you can see from the point he gets let past to the pit stops. He didn't help himself by locking up and throwing that away on a couple of laps (looking at the data I'm going to guess those were laps 13 and 15 since Leclerc goes slightly quicker). 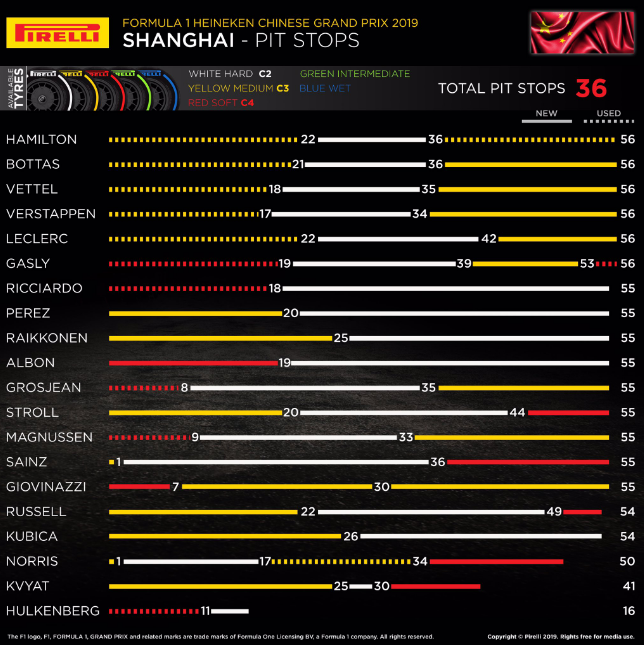 I'm not a fan of team orders and I dont think 1-2 tenths justifies it but in Ferrari's defence they couldn't have known it wasnt more at the time. Yeah I'd agree. Vettel also admitted he thought he would be quicker than he was after being let through, but hindsight is a wonderful thing of course. I think Ferrari did what they had to do with moving Leclerc aside. If I was Leclerc though I'd be very angry that after I was moved out of the way I was treated as an after thought for the rest of the race. The ones reading Italian can go to the Gazetta dello Sport website. Though La Gazetta is trying to keep its balance on the fence, it looks like their Italian readers are not impressed by Ferrari strategists and their drivers political management, and find difficult to see any difference between Arrivabene and Binotto.